Just a brief explanation is in order regarding the picture in our last post. This gentleman, a bona fide free spirit who usually wears nothing but a thong, runs a used book store in Quartzsite. The day we visited his store, the temperature outside was only in the 50's which is why he had put a sweatshirt on. Needless to say , his lack of attire was a bit distracting!We will spare you a view from the front!! 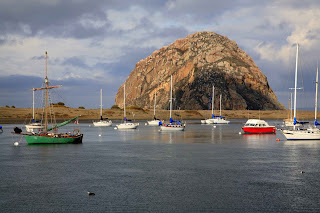 We arrived in Morro Bay, CA last Friday afternoon after a drive up Highway 101 from Ventura. Morro Dunes Rv park is only a few yards from the Pacific Ocean with 576 ft Morro rock looming in from of us. 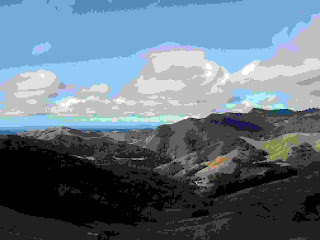 It is the last in a chain of long-extinct volcanoes known as “The Morros” ...totally awesome! Today we woke to another beautiful sunny day. 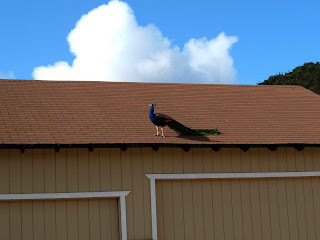 Our plan for the day was to drive up the coast about 15 miles to Cambria and then drive over to Paso Robles and check out the area and a few wineries. But I don't start my day without coffee so I got the coffee brewing and John started fixing breakfast while I took a quick shower. After sitting down to a great breakfast of eggs, canadian bacon, and a whole wheat dried cherry scone (south beach friendly of course...thank you Linda) we headed out for the day. 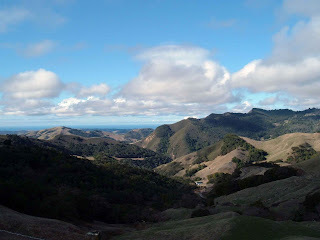 The drive up Highway 1 to Cambria is breathtaking with the ocean on the left and the rolling hills on the right. Cambria is a cute coastal town with some interesting shops but this being Sunday morning and only 10am there wasn't much happening yet. One of my goals during our time on the road is to visit shops/restaurants/bakeries/etc. that I have read about or heard about on tv . One place I wanted to check out was Linn's of Cambria. This family run business started out in 1977 as a farm stand about 5 miles from town and became well known for their Olallieberry pies ( pronounced lolly- berry). The Olallieberry looks like a blackberry but is genetically about 2/3 blackberry and 1/3 red raspberry. I had seen their business featured on the Food Network show “Food Finds”. Well it turns out that the Main Street location had a major fire this past summer and they are in the process of rebuilding. Their restaurant on Bridge St. is only open for lunch and dinner. So, we decided to go out to their original location on Santa Rosa Creek Rd. This is a winding 2 lane road with awesome views. 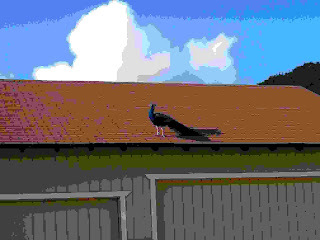 The shop was open and after looking around, buying some Olallieberry jam, and admiring the noisy peacock we continued on working our way up to Paso Robles. The pictures don't do this area justice...the views are breathtaking!! Paso Robles is about halfway between Los Angeles and San Francisco and about 25 miles from where we are here in Morro Bay. 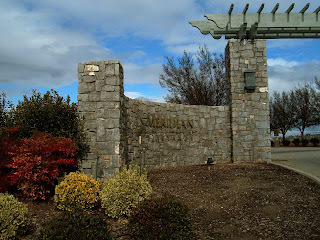 We visited a couple wineries and then had lunch at the Odyssey Cafe in the downtown district. Very nice, casual and the food was very good. And just so you don't think we only do wine tastings, we stopped at Pasolivo Olive Oil Co. and had our first ever olive oil tasting! 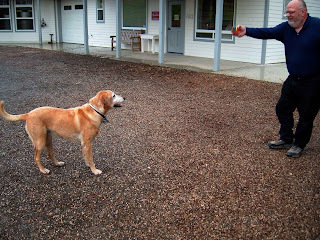 And as an added bonus got to play with the resident golden retriever. They have nuevo(new) oils as well as citrus flavored oils...quite good. We joined their olive oil club so we'll be getting quarterly shipments throughout the year. We were both impressed with this area and we hope to go back over there this next weekend. By the time we got back to the rv it was peanut time. Roasted unsalted peanuts in the shell. Bob and Linda of http://www.because-we-can.net/ introduced us to this wonderful afternoon at 4pm ritual and we've adopted it in our daily lives as well. Dinner was just a snack meal of hummus, guacamole, salsa and bean chips with fresh carrots on the side. John worked a bit on the blog, I did some knitting, and then it was time for bed. Another wonderful day of RV living.